“By the greatness of God Khaldi, Argishti, son of Menua, built this impregnable fortress, called Erebuni, to the power of Biainili and the horror of its enemies”. The name of Yerevan, according to the most common point of view, comes from the name of Erebuni fortress. 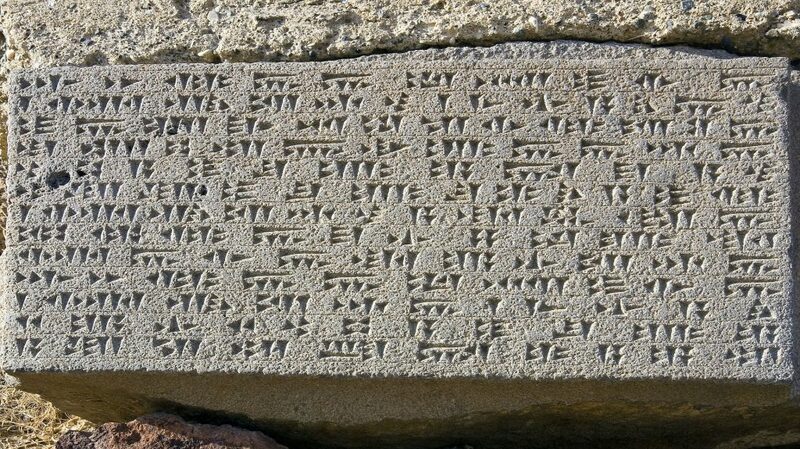 According to another view, this means the settlement of the tribes of Eri or Ari. Some researchers link it with the Bible tradition of Noah’s Ark. According to this, after seeing the first dry land from the top of the mountain Ararat after the flood, Noah cried out that the dry land was seen (yerevats), hence the name of the city Yerevan. Yerevan is 30 years older than Rome, the Eternal City. According to historical information, the first residents of Yerevan were 6,600 soldiers, who had been settled down in the city by Argishti. Erebuni was a powerful military, administrative and economic center in the kingdom of Van (9th-7th centuries) for almost 100 years. It was called Urartu, Nairi by Assyrians. Urartians called it Biainili. The Bible mentions it as a land of Ararat. Over time Erebuni gave way to Teishebaini fortress (located in Karmir Blur) built by Rusa II (7th century BC). The next important period in the history of Yerevan is associated with another ancient settlement Avan-Arinj (2nd – 1st century BC). The ancient settlements discovered in Yerevan are Shengavit (5th-3rd millennium BC), Tsitsernakaberd, the square near the station, Avan, Zeytun districts (1st half of the I millennium BC), Karmir Berd (the end of II millennium BC), etc. The excavations carried out in different parts of Yerevan show that these territories have been inhabited since ancient times, more than 80 thousand years ago. From the Yerevan cave have been discovered a skeleton of the Stone Age man and work tools, which are in the Yerevan History Museum (created in 1931), including about 90,000 other exhibits. Due to various factors, Yerevan ceases to be a capital in the following centuries. 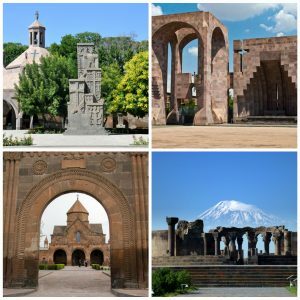 Throughout its history, there have been 12 capitals in Armenia. Despite attacks and destructions by Assyrian, Roman, Byzantine, Persian, Arab, Seljuk, Mongolian, and Turkish conquerors, Yerevan survived and was eventually proclaimed the capital of the Republic of Armenia on 28 May 1918. On 29 November 1920 was declared the capital of Soviet Armenia and on 21 September 1991 the capital of the independent Republic of Armenia. The construction of Yerevan was started in 1924, according to master plan of Alexander Tamanyan. Mainly was used pink tuff, which gives a unique shade to the city. That is why Yerevan is called “Pink City”. The capital was given special shine and color by the centuries-old churches as well. The symbols of Yerevan are coat of arms, flag and anthem. The last was devoted to Erebuni-Yerevan 2750th anniversary by the composer Edgar Hovhannisyan and the poet Paruyr Sevak. The first official celebration of “Erebuni-Yerevan” was held in October 1968 and was dedicated to the 2750th anniversary of the foundation of the capital. The jubilee celebrations lasted about a week. There were created many books, films and songs, dedicated to Yerevan, were opened exhibitions, were produced various jubilee souvenirs which have been reminding of that magnificent celebration. The great events were the Flower and Song Festivals, when the choir consisting of 2750 singers performed the current anthem “Erebuni-Yerevan” for the first time. One of the significant events in those days was the opening of the Erebuni Historical and Archeological Museum at the foot of Arin Berd Hill. Adjacent street to the museum was named “Erebuni”, a park with 2750 fountains was opened in the Republic Square, was placed a source-monument. Erebuni carpet was created and 2750 trees are planted at the foot of Arin Berd. By the decision of Armenian authorities in 1983, Erebuni-Yerevan holiday becomes annual. 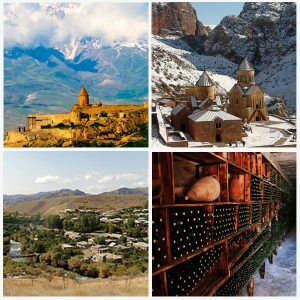 More than 50 events are planned to be held within the celebration of the 2800th anniversary of Erebuni-Yerevan. 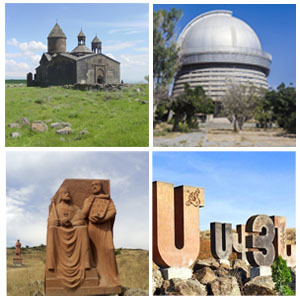 A number of scientific events and an international conference on Armenology will take place. The main events will be held in the Republic Square and Erebuni Museum. Yerevan will have a new park with a fountain complex. Large urban development projects will be implemented. One of the important initiatives is the creation of the carpet “Erebuni-Yerevan 2800”, which is already in the Yerevan History Museum. 4 m wide and 7 m long carpet is a unique canvas that shows the history of Erebuni-Yerevan. The birth certificate of Yerevan and Urartian cuneiform inscription are presented at the center. On both sides of the carpet are pictured the founder of Erebuni fortress king Argishti and the new Yerevan architect Alexander Tamanyan. One of the central episodes is the picture of the tree of life, symbolizing the continuity of life. 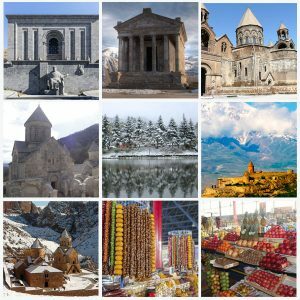 The 12 capitals of Armenia and the buildings which are considered Yerevan’s state, cultural and spiritual symbols are typically presented on it as well. The 12th Yerevan International Music Festival is dedicated to the 2800 anniversary of Yerevan. 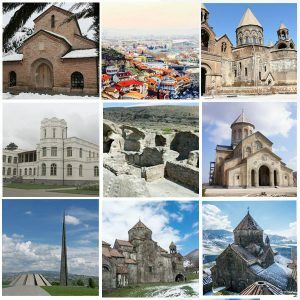 In Armenia and Artsakh, under the motto “Cultural Heritage” were held the Days of European Heritage. During the events were organized various exhibitions, concerts, meetings, discussions, lectures, literary and musical matinees and etc. Various festive events dedicated to the great jubilee are held throughout the year in Yerevan and abroad.